Click the image above for a larger preview. KMAC’s educational platform also contains several convenient social-network features like user profiles, friends (fellowships), activity streams, forums, messages, notifications, and more. The ‘Activity’ stream area is where any sort of activity can be recorded. Instructor posts, new friendships and comments are among the most popular activities recorded. Your ‘Mentions’ page shows all the “@ mentions” you received from other members or instructors. This is a list of all the items (posts, comments, friendships, etc.) you have “favorited” in your ‘Activity’ Stream and Forums. This panel shows all of your friends’ activities throughout the platform. KMAC is an online non-denominational educational platform that is committed to training excellence. Our goal is to provide our affiliate churches, partners, members with quality biblical, theological and leadership instructions to ensure, according to the scriptures, “that the man [or woman] of God may be perfect, thoroughly furnished unto all good works” (2 Timothy 3:17). 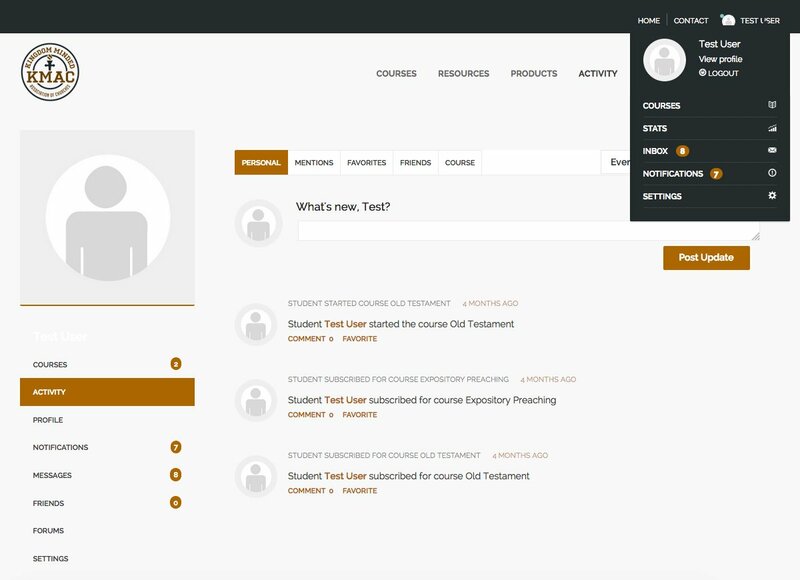 Courses on KMAC are currently broken down into sections comprising various classes including Old Testament, New Testament, Foundations of Faith, and Expository Preaching. There are several lessons within a single course. KMAC classes consist of an assortment of Q & A’s, quizzes, videos, audio lessons, download guides, books, and more. What are the Differences between Workshops and Courses? KMAC provides an array of certified personal and professional development workshops consisting of both Applied and safeTALK Suicide Interventions, Family Wellness, Family & Marriage Relationships (Prep 8.0), MBTI Training, and more. Unlike our online courses our workshops are currently facilitated offline and are available upon request. Click here to learn about each of our workshops. Membership is FREE. Membership is available by request via our contact form or during open course enrollment periods. Do you have a support question? Please submit your support question below.